Have Protests Killed the Keystone XL? TransCanada Asks U.S. for Delay in Face of Likely Rejection | Democracy Now! co-founder of 350.org. He’s the author of several books, most recently, Oil and Honey: The Education of an Unlikely Activist. AMY GOODMAN: The corporation behind the Keystone XL oil pipeline has asked the Obama administration to suspend its long-running review of the controversial project. On Monday, TransCanada told the State Department it wants to wait until Nebraska, a state along the pipeline’s route, gives its approval. But critics say TransCanada is trying to buy time until President Obama leaves office. After multiple delays, Obama has promised to decide on Keystone before the end of his second term. The project has emerged as a political flashpoint, with defenders calling it a boost to the economy and opponents warning of a devastating impact on the planet. The proposed pipeline would transport 830,000 barrels of crude every day from Alberta’s oil sands to refineries on the U.S. Gulf Coast for export. In a 2013 speech, President Obama said his decision will turn on assuring it does not significantly exacerbate the problem of carbon pollution. 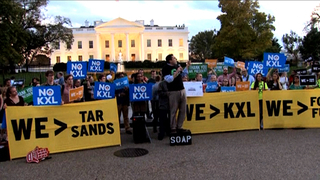 Since then, there’s been growing speculation Obama will ultimately reject Keystone XL. The pipeline has faced years of sustained protests from groups including indigenous communities, environmentalists and land owners along its route. It’s unclear now if the administration will grant TransCanada its delay. If it does, the decision on Keystone XL would be pushed until after the 2016 election and possibly handed President Obama’s successor. That’s led many to speculate TransCanada is throwing a Hail Mary in the hopes the next White House occupant is a Republican. For more, we’re joined by Bill McKibben, co-founder of 350.org, the environmental group that helped lead the protest against the Keystone XL, has helped organize major protests against the pipeline outside the White House, including a historic act of civil disobedience in August of 2011 when he and more than 1,200 others were arrested. Bill, welcome back to Democracy Now! Talk about the significance of TransCanada saying they want to pull back their request for a permit from the State Department. BILL McKIBBEN: Hey, Amy. Well, look, a remarkable moment, really. Since you were one of the few reporters covering this story early on, you’ll remember that in 2011 TransCanada was so confident of victory that they mowed the route of the entire pipeline, planning to begin construction within weeks. It was a done deal, and it’s been becoming spectacularly undone ever since. This was kind of the final tossing in of the towel from TransCanada. They know that they can’t get approval out of the Obama administration, so they want to avoid the ignominy of actually being outright rejected. In literal terms, it probably doesn’t make much difference. If a Republican gets elected, they can just restart the whole thing and, you know, call it something else—the Triple Happiness for American Patriots pipeline or something—and get going all over again. This is a remarkable victory for the remarkable coalition, led by indigenous people, farmers and ranchers, climate scientists, faith communities. And the good news, really, above all, about it is that it’s a victory not confined to this particular pipeline. A couple of weeks ago, the head of one of the big fossil fuel industry trade groups gave a speech in which he said to his colleagues, “We simply have to figure out a way to stop the Keystonization of every fossil fuel project.” Around the world now, there is not a single major fossil fuel project that does not meet with resistance of some kind, and increasingly that resistance is successful. Keystone was one of the birthplaces of that resistance. And though we continue to want the president to give it the official no, the fact that TransCanada has given up is—well, it was a good night last night. AMY GOODMAN: Now, they didn’t just end their—TransCanada didn’t just say they’re ending the pipeline. They want a delay in the permit process. AMY GOODMAN: They say to get Nebraska’s approval for the route. BILL McKIBBEN: Yeah, yeah. I mean, obviously, all they want is a different president. And even if the president does what he should do and rejects the pipeline outright now, they’ll still be able to start again with a new president, should we be unwise enough to elect one of their favorite candidates. What would be good would be for the president to forthrightly deny the pipeline, mostly because it would then allow him to go off to this Paris climate conference with some real credibility as the first world leader to have stopped a big fossil fuel project because of its effect on climate. But as far as this pipeline getting built, think about it. A done deal in 2011; now, at least through 2017, there’s no pipeline. People, coming together, have stopped for six years 800,000 barrels a day of the dirtiest oil on Earth from getting out of the ground. In the course of doing that, they’ve made life almost impossible for the big companies up in the tar sands, who have withdrawn tens of billions of dollars’ worth of capital from expansion projects. This is one of the great environmental victories in decades. And as I say, the reason it’s so important is because it’s the gift that keeps on giving. It gives us all faith that we can keep mounting these kind of battles, as long as we display the same kind of unity and purpose that we displayed here. AMY GOODMAN: —just turn down the Keystone XL? BILL McKIBBEN: Sure. The State Department should just say, “No. You know what? You don’t really get to ask for extra innings when you’re behind at the end of nine.” We’ve already said that the way we’re going to make this decision—this is what Obama and the State Department have said—are on climate grounds, not on the grounds of the route through Nebraska. Clearly, the route through Nebraska isn’t going to change the amount of carbon this thing pours into the atmosphere. So they’re well within their rights—in fact, they obviously should simply say no. Who knows whether they’ll have the courage to do that or not. We’ll continue to ask them to. 350.org, many other groups sent out letters last night asking people to remind the administration that they still have a role to play here. But let’s be serious. In the end, this was never really about the power of the administration. This was about the power of organized people to come together and change the script—and that’s what’s happened here. AMY GOODMAN: Bill McKibben, I want to thank you for being with us, speaking to us from his home in Vermont. Bill McKibben is co-founder of 350.org. This is Democracy Now! When we come back, why are hundreds of thousands of people who signed up for health insurance scrambling now because their healthcare insurance companies, actually co-ops, are going under? Stay with us.